The engineering sample spotted by Tum Apisak in the UserBenchmark database has a designation that is consistent with previously leaked codenames. 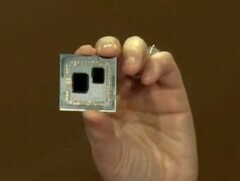 As far as specs go, the early sample can boost to 3.7 GHz on a 105 W TDP, and also features 32 MB of L3 cache. In single-core tests, the 12-core CPU is 13% faster than the Ryzen 7 2700X. Everyone was expecting a grandiose reveal for the Ryzen 3000 series at CES, but the red team rushed the Zen 2 presentation and fans were a bit disappointed. Overall, AMD revealed very few specs for the upcoming Ryzen 3000, but CEO Lisa Su did mention that we might see CPUs with more than 8 cores since there is enough room for an additional chip on the CPU die. Just recently, trusted leaker Tum Apisak spotted an AMD engineering sample with 12 cores and 24 threads in UserBenckmark’s online database, so chances of seeing commercial 10-core and 12-core Ryzen 3000 CPUs are quite high. The UserBechmark page reports that the tested sample is in line with previously leaked codename Matisse CPUs that have the H2 designation at the end of the product string. To further reinforce the fact that the Zen 2 CPUs will be compatible with existing platforms, the benchmark mentions that the CPU was tested on a Myrtle-MS dev motherboard that is based in the current AM4 chipset. This sample was running at 3.4 GHz by default, and it was able to boost to 3.7 GHz with a 105 W TDP rating. Since this is an early prototype, the frequencies might not be set to their highest, with final versions possibly running at more than 4.0 GHz. Additionally, the CPU sample looks to integrate 32 MB of L3 cache memory, and its single-core performance is roughly 13% higher than that of a Ryzen 7 2700X. If this indeed turns out to be one of AMD’s Ryzen 3000 models, there is a strong possibility that the red team may introduce mainstream CPUs with as much as 16 cores and 32 threads this year.